This month is National Ice Cream Month.Did you know TasteSpotting is partnering with Dreyer’s/Edy’s Slow Churned Light Ice Creamto feature all kinds of Ice Creams. I don’t need a reason to eat ice cream, but this is a really good excuse to enjoy it for a whole month. I love ice cream and nothing screams warm weather better than ice cream. 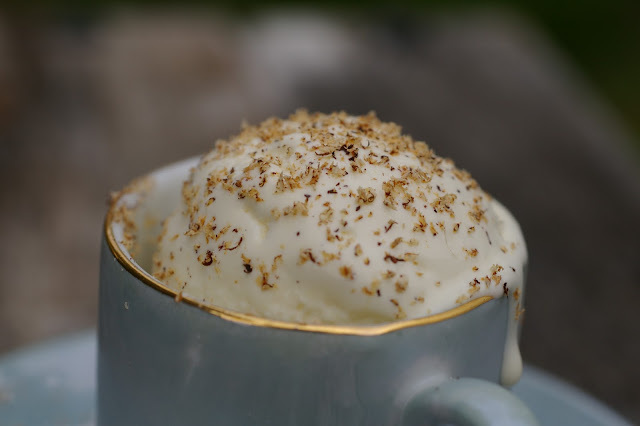 I am talking homemade, creamy ice cream. Remember when you were young and you had the hand cranked ice cream maker? I never really liked to crank that thing. I wondered how they kept the salt and ice out of the ice cream. I do know that I did really love that ice cream. Now I have a really cool ice cream maker that I got from Bed Bath and Beyond. It has a canister that you freeze. All you have to do is put your custard in add the paddle and let her rip. So you see, there is really no reason for you not to enjoy homemade ice cream this month. Or any other month either. Honestly, the hard thing about making this ice cream, is not dipping that spoon into that creamy lusciousness before it has set all the way. Toast grated nutmeg in a skillet over medium heat, 1–2 minutes. Remove pan from heat; set aside. Heat half-and-half and cracked nutmeg in a 4-qt. saucepan until it just begins to simmer. Remove from heat; let steep for 10 minutes. In a bowl, whisk together sugar and yolks. While whisking, slowly pour in half-and-half mixture. Return mixture to pan; cook, stirring, until mixture thickens, 8–10 minutes. Pour through a fine strainer into a large bowl. Whisk in toasted nutmeg and cream; cover custard and chill. 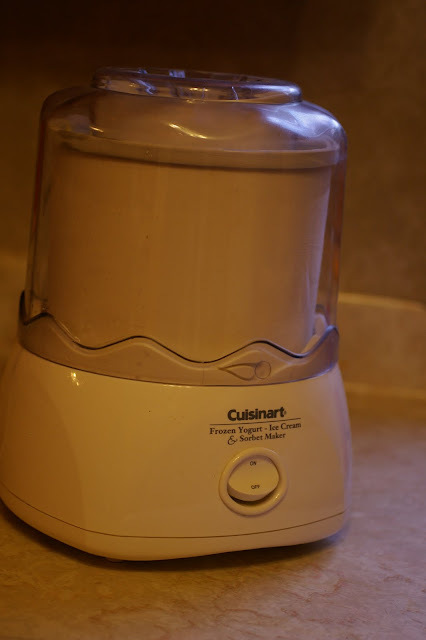 Freeze custard in an ice cream maker; transfer to an airtight container. Freeze until set before serving. I have the same ice cream maker! Your top photo is marvelous…it just screams summer deliciousness! wow what great mouth watering photo’s I am wishing for ice cream now! OH MY GOSH!, I’m with you I LUV ice cream. I just posted a strawberry yogurt recipe. 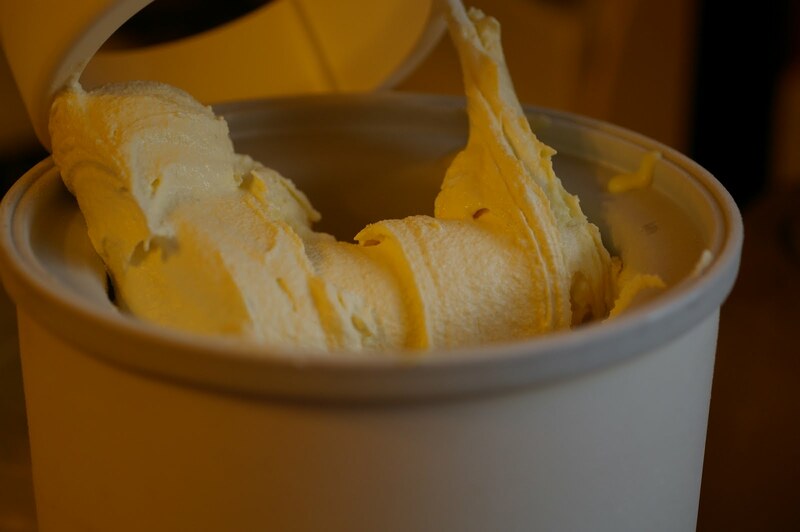 I must buy myself an ice cream maker – I think it will be my most favored possession LOL. This is great! I am planning on making Homemade Ice Cream for the 4th of July! That is a great picture! I would love a big bowl of this! *Drools…. * I want an ice cream maker SO badly!!! This looks so good right now… Yum! I haven’t busted out my ice cream maker in so long. Thanks for reminding me of Ice Cream month! I just got an ice cream maker this year too! I love it. 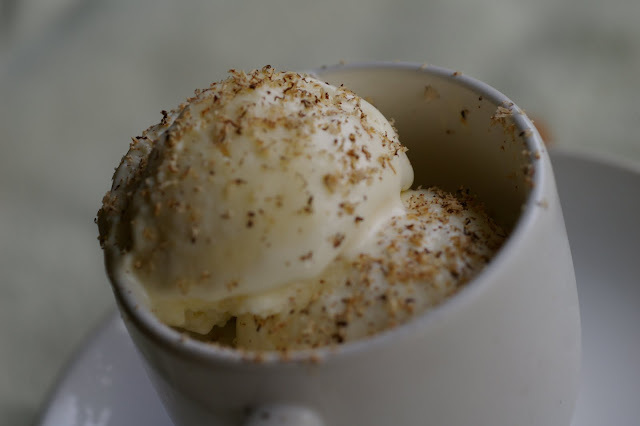 I think your nutmeg ice cream sounds delicious. I will have to try it one of these days. I need to get one of those. The ice cream sounds delish Veronica….I would have to dip in before it was ready…sorry! I have a ice cream machine which I hardly use..hehe…your ice cream with nutmeg looks terrific! Must admit I love recipes that require minimal effort. This is more due to to the fact that I think, “ice cream! Now!” So I came up with easy Mexican Chocolate ice cream and spiced cinnamon honey ice cream sandwiches. Neat ice cream flavor! I can see this being a good winter flavor too; maybe on top of warm apple pie. Yum! How unique and refreshing this is-love that close up shot of the beater covered in ice cream-yum-buzz! Love fresh ground nutmeg!!!!!! Dontcha’ love those ice cream makers. We have one and bought everyone else in the family one about 5 Christmases ago. We finally have an ice cream maker that works but it isn’t nearly as good as my parents had when I was growing up. Over on The Chocolate Cult we’re doing featured reviews of ice cream for the next few months so I hope you check us out, Veronica. I will have to try this. I’ve had cinnamon ice cream and thought it was fabulous. I also love nutmeg, so this could be a really delicious combination!